First spirit day this Friday. Wear school colors or your new Tiger Tog. No other spirit days scheduled yet. You should have received your directory forms this week. Please get them in asap so we can start putting the directory together. If you are interested in being a sponsor, please let us know. Tiger Tog order forms are now available on the website here. We would like order forms turned in by next Friday for this ordering period. If you have any questions, please feel free to email Erik Larson at larsones@sbcglobal.net Thank you! It’s not too late to turn in Walk-a-thon fundraising donations! 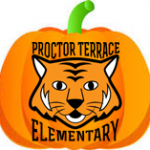 Walk-a-thon Awards Assembly, it will still go to fund all the great things the PTA is doing at Proctor Terrace. If your child did not participate in the Walk-a-thon, please consider making a flat donation to the PTA. Our fundraising goal was $75 per student. 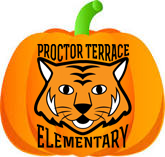 Checks can be made out to Proctor Terrace PTA and/or donations can be made via Paypal on the school website. This is the PTA’s main fundraiser of the year. Thank you for your support! 83% of the school walked and rolled on International Walk and Roll to School Day! We are one of 10 schools that received a grant to take a look at creating safer routes for getting to school. If you are interested in having your voice heard on this, join us for a “walkabout” with the Department of Health. We will take a 2 hour walk through the neighborhood. It is a one time, one morning commitment. Email me at conniesultana@sbcglobal.com and we will work to set the date. Tigerfest is just around the corner. Oct. 27th 12-3. We still have a lot spots that need filled. Make sure you get all your class spots filled or the game may have to be cut. We also have lots of other spots that need to be filled like Redemption Island and Food Booth. If you have friends, older children or grandparents who would like to help please fill free to have them sign up online here. We also need tables, awnings and coolers loaned to us for the day of too. Candy donation box is in the hallway by the PTA Bulletin Board. Please donate if you can. We really need Dum Dum lollipops. Tigerfest Tickets are 3 for $1 until October 23rd. You can find the form online here. Come and join the Proctor Terrace PTA in our very first Dine and Donate of the year on Monday, October 28th, from 5-8pm at the Chipotle in Coddingtown Mall. Just bring the flyer to Chipotle (coming home soon), or mention that you’re there for Proctor Terrace, and they will donate 50% back to the PTA. 50%! This is the easiest fundraiser you’ll ever take part in, and you don’t have to cook dinner for a night. It’s a win-win situation for everyone! At the past few general PTA meetings, we have discussed setting up a spending committee. I have agreed to be the chairperson this year. The committee will meet to discuss any unallocated funds that the PTA has in the bank that are not needed for the current year’s budget and to discuss ideas on how to to spend it. This committee came about after Kathy Doig presented the idea of ordering new outdoor tables for the classes in the portables to use. As a board, we thought it would be wonderful to have a group of parents get together to discuss ideas that would make Proctor Terrace even better than it already is. The committee is open to any and all. Please contact me directly if you would like to be involved and I will be setting our first meeting time soon. If you are unable to fully commit due to time constraints and you have ideas, please feel free to email me at kkiessigphoto@gmail.com to pass on ideas at our future meetings. from all over Sonoma County, in this family fun 5k open to the community. It is a flat, paved, tree lined course using the lovely Copeland Creek Pathway. Anyone from the most competitive runner to the recreation walker can participate. Families, friends, and strollers are welcome! Come rain or shine to….Run, walk, cheer!